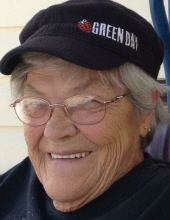 Margaret Marion Mullins passed away peacefully at home, surrounded by family on January 19, 2019. Marge was born September 4, 1933 in Hood River, Oregon to Velma and George Straub, 1 of 7 siblings. The Straub family eventually relocated to California and that is where Marge remained, first having her own family of 5 children; Judy (Wayne), Mike, Earl (Sharron), Lori and Richard, then caring for Velma and finally enjoying retirement with her loving husband of 51 years, Ted Mullins before his death in 2010. When Ted passed away, Marge decided to head for a new adventure in Bozeman, Montana with her granddaughter, Alicia. Marge joined her 9 other grandchildren, 17 great-grandchildren and 8 great-great grandchildren and got to enjoy days watching her family grow and thrive. You could usually find Marge working puzzles, crocheting or playing Yahtzee while hanging out with her beloved pups, Buddy and Maddie. She loved Steve Harvey and occasionally, a good margarita. Marge had a big heart and an even bigger smile that could light up the whole room and it is that smile we'll miss the most. Marge was preceded in death by parents Velma and George Straub; husband William Stewart; husband Ted Mullins; sisters Emma, Gertrude, Gladys and Melda; brother George Jr. and son-in-law Chuck Martin. Marge leaves behind kids, grandkids, great grandkids, great-great grandkids, siblings Barb and Don and pups Buddy, who never left Marge's side in her final hours and Maddie; numerous nieces and nephews and extended family that spans from coast to coast. A memorial will be held at Bozeman Christian Center, 921 W. Mendenhall, Bozeman, MT on February 1, 2019 at 1PM. The family asks in lieu of flowers that donations be made in her honor to either Hospice of Bozeman Health, 3810 Valley Commons Drive, Suite 1, Bozeman, MT 59718 or Tiny Tails K-9 Rescue, PO Box 257, Manhattan, MT 59741. To send flowers or a remembrance gift to the family of Margaret Marion Mullins, please visit our Tribute Store. "Email Address" would like to share the life celebration of Margaret Marion Mullins. Click on the "link" to go to share a favorite memory or leave a condolence message for the family.